Dr. Mimi Guarneri is Board-certified in Cardiovascular Disease, Internal Medicine, Nuclear Cardiology, and Integrative Holistic Medicine. Dr. Guarneri is a Founder and President of The Academy of Integrative Health and Medicine. She serves on the Founding Board of the American Board Physician Specialties in Integrative Medicine, and is a Clinical Associate Professor at University of California, San Diego. An award-winning physician and researcher, she has been recognized for her national leadership in Integrative Medicine by the Bravewell Collaborative, and she served as chair of the Bravewell Clinical Network for Integrative Medicine. After graduating number one in her class at SUNY Medical Center in New York, Dr. Guarneri began her career at Scripps Clinic as an attending in interventional cardiology, where she placed thousands of coronary stents. Recognizing the need for a more comprehensive and holistic approach to cardiovascular disease, she founded the Scripps Center for Integrative Medicine and served as Medical Director for 15 years, where state-of-the-art cardiac imaging technology and lifestyle change programs could be used to aggressively diagnose, prevent and treat cardiovascular disease. In 2014, Dr. Guarneri Co-founded and began serving as Medical Director of Guarneri Integrative Health, Inc. She has served as a senior advisor for large healthcare systems to develop integrative medicine and wellness centers. 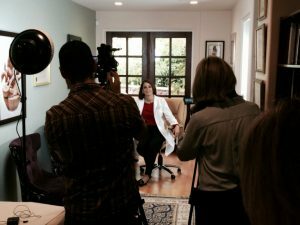 Dr. Guarneri has been interviewed on many nationally-syndicated television shows including The Dr. Oz Show, NBC Today, and PBS Full Focus and To the Contrary. Her work also was featured in a two-part PBS documentary, The New Medicine. She is author of The Heart Speaks: A Cardiologist Reveals the Secret Language of Healing (2007) and 101 Pearls to Awaken Your Healing Potential (2017). She is co-author of Total Engagement: The Healthcare Practitioner’s Guide to Heal Yourself, Your Patients & Your Practice (2014). As professor of The Great Courses series, The Science of Natural Healing, she presents 24 of her 30-minute lectures in video and audio formats. She has published extensively in peer-reviewed journals and is a frequent lecturer at symposia sponsored by such medical institutions as Scripps Health, Wright State University, University of Alberta, The Heart Institute of Dayton, Meridian Healthcare, Atlantic Healthcare System and the American College of Physicians. The recipient of numerous awards and a leading proponent of Integrative Medicine, Dr. Guarneri was ranked by Newsmax Media in 2015 as number 6 out of the top 100 physicians who embrace Integrative Medicine. Dr. Guarneri was honored as the ARCS Scientist of the Year in 2009. In 2011, she received the Bravewell Leadership Award, which honors a physician leader who has made significant contributions to the transformation of the U.S. healthcare system. In 2012, The Institute for Functional Medicine honored her with the Linus Pauling Functional Medicine Lifetime Achievement Award, and she also received the Grace A. Goldsmith award from the American College of Nutrition. She helped create and continues to direct several national integrative medicine-based conferences in San Diego that draw thousands of healthcare providers from across the United States and globally. 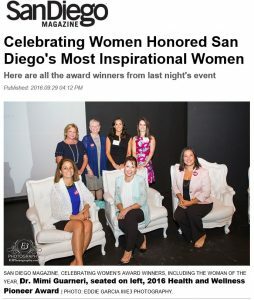 San Diego Magazine’s Woman of the Year Awards honored her with Health & Wellness Pioneer 2016 for her significant development of the San Diego region as a leader in Integrative Medicine.